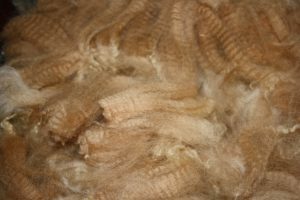 This page will give you information on sorting and grading alpaca fleece. This knowledge is useful for the hobby farmer when selecting new animals to add to your herd and to market the fleece of your animals after shearing. It is also useful for people buying raw fiber. Alpacas exhibit 11 different colour classes: white, beige, 3 degrees of fawn, 3 degrees of brown, bay black, true black, silver or rose greys. Some breeders concentrate on one colour however it is very difficult to breed for specific colours since genetics play games with us. I owned a true black female from a medium fawn male and a beige female. Obviously both parents had black in their bloodlines. The length is measured from the base of the cut to the tip without stretching. The alpacas are shorn once a year so the length corresponds to annual fiber growth. When the animals are very old, they will grow a lot less length and can be shorn every other year. When the quality of alpaca fiber is determined, this characteristic account for 70% to 90% of the evaluation. The diameter of the fiber is measured with specialised equipment. Fiber with a diameter of 20 microns or less is very sought for. This fiber is often called baby alpaca. There are other criteria to determine the quality of fiber however the ones above are the most important. Visit this page again. The information here will be very useful. I have very little knowledge about alpacas. Are they only useful for the fibers? What can you produce with their fibers? For how many years an alpaca can be productive? I think you should post more general information about alpacas, so farmers can decide where ever or not to buy this kind of livestock. The main product of alpaca breeding is the fleece. Breeders also make money selling animals and selling stud services. Some large farms produce meat however this use is still very rare in Canada. It is more done in South America. An alpaca in US or Canada live to the age of 20 but the fleece is normally best in the first 10 years of their life. Many products may be made out of alpaca including all the garments made of sheep wool. The yarn compares to the best sheep wool without the lanoline and the itchiness. We mostly see alpaca socks, scarves, mittens, sweaters and felting products. I will get my alpaca breeder friends to write blogs on my site later this year. They have a lot more experience with the product side of alpaca fiber.